Here is a quick update on the Brent-WTI spread dynamics. 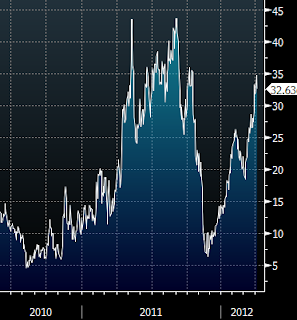 As discussed earlier the US crude inventory and the Iran uncertainties have been the drivers of the spread. The Iran situation has not changed much since, although nuclear talks are now a certainty. Iran has no real choice but to agree to the talks. 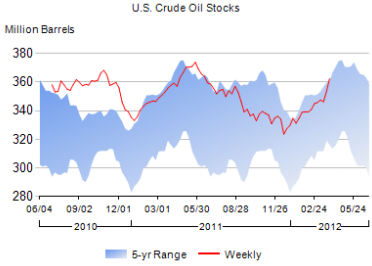 As far as the US crude inventories, the amount of crude oil in stock continues to rise, now near the top of the 5-year range. 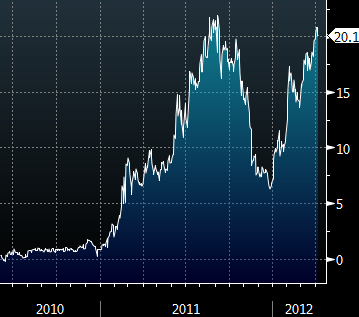 That has not only stalled the rally in crude oil, but also widened out the Brent-WTI spread to above $20/barrel. Again the reason for monitoring this spread closely is that US gasoline prices correlate closer to Brent prices than to WTI. The chart below shows the spread between US Gasoline Futures and WTI Futures (the gasoline crack spread), which has moved up with Brent-WTI spread. Put another way, the amount that US refineries can charge for their product depends to a large extent on the Brent-WTI spread. Given this spread's direct impact on the US consumer, the Iran resolution may now be even more critical to the fragile US economy.